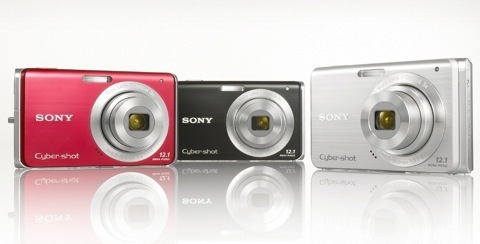 Two slim, stylish Cyber-shot digital cameras from Sony offer outstanding quality and value to suit every pocket. The Cyber-shot W180 and W190 are the perfect no-fuss choice for anyone who needs to capture family moments, holidays and nights out. Both models look great with slim, clean lines and a choice of silver, black or red colour finish options. Ideal for first-time photographers, they’re beautifully easy to use, with a simple slide switch to select photo/movie/playback modes. For maximum creative freedom, a choice of seven Scene Selection modes adjusts camera settings automatically to suit virtually any subject. While they offer superb value, the Cyber-shot W180 and W190 don’t compromise on class-leading picture quality and easy-to-use features. A high resolution of 10.1/12.1 effective megapixels (W180/W190) ensures crisp, detail-packed enlargements to A3 size and beyond. Pristine picture quality is further enhanced by the high-quality 3x optical zoom lens. Smart zoom boosts maximum magnification to a frame-filling 18x for W190 and 17x for W180 for even more dramatic close-ups. There’s also a generously-sized 2.7” Clear Photo LCD screen for a bright, clear view of images and quick confirmation of camera settings. Improved Face Detection recognises up to 8 faces in a scene, fine-tuning focus and exposure for better-looking portraits. For even happier people pictures, Smile Shutter automatically takes a picture when your subject smiles. SteadyShot image stabilisation reduces the effects of camera shake when you’re shooting handheld. A special shooting mode boosts sensitivity to ISO 3200, letting you freeze moving subjects with faster shutter speeds or capture atmospheric interiors without flash. Also supplied, the latest version (4.2.01) of Picture Motion Browser software (for PC) makes it easy to manage and share your collection of digital photos and video clips and for uploading these to YouTube, Picasa or other image and video sharing web-sites. The Cyber-shot W180 and W190 compact digital cameras are available from July 2009.